I have a great FREE printable banner for you as apart of this awesome Printable Tour put on by the lovely Kristen at the Ella Claire Blog. 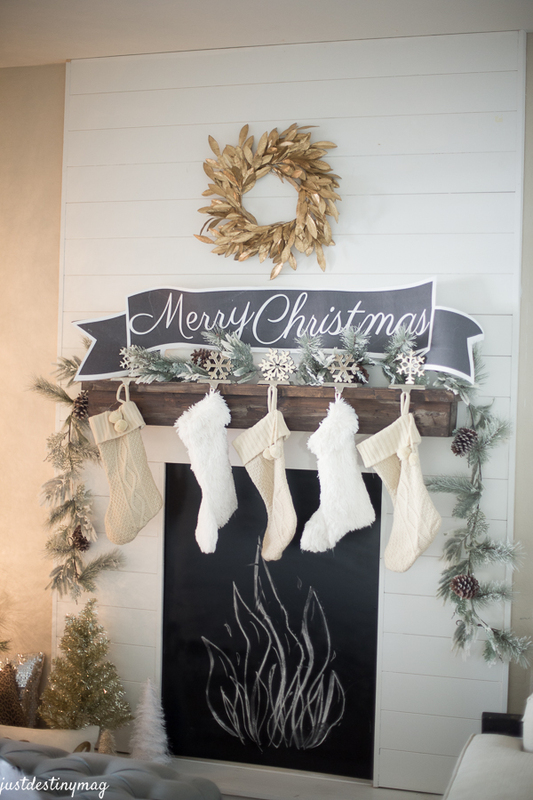 I actually used this same banner in my Christmas Mantel last year and never got to share the detail on it so I’m excited to share with you today! I made this banner in Photoshop and had it printed out at WALGREENS! I used a coupon and it came out to $12.95!!! I really love using them because you can pick up most items SAME DAY! Including this banner that’s 2ftx6ft long. It makes for the perfect banner because it’s large and beautiful! I’ve never seen anyone use this little secret of mine so I’m sure you guys will have TONS of fun showing off how you used them in your home! 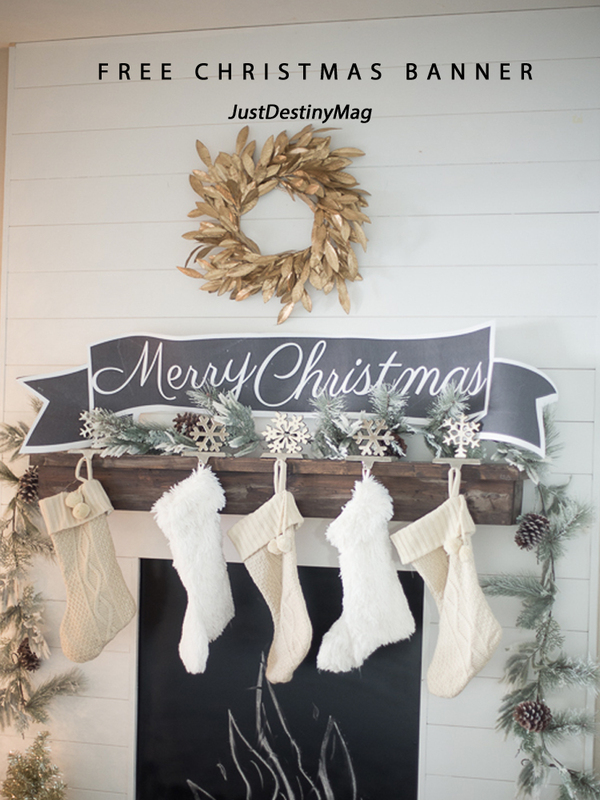 I have a couple of tricks on how to make it look JUST like my mantel banner so go ahead and read on! The first thing you’re going to want to do is download or save one of these photos to your computer. I already premade them for you. YAY! Click on photo and save! The actual print you get is pretty matte and the color is not the most VIBRANT so using neutral colors like the black chalkboard look I went with is best! Then sign into your Walgreens acount and upload your banner! Choose to print a 2×6 banner (under the POSTERS tab) with same day pickup! After that choose the one photo option for the 1×6 banner. This lets you choose any photo to be your banner. Then drag the banner into the banner box. Click order and enter any coupon codes you may have. I have a few below for you! Once you get it home unroll it and lay it out on your floor. So cool right? Same Day folks! I think mine took about an hour to make! Then use some scissors to cut just out side the white lines. This make the banner have a border! After that you can hang it anywhere in your home! I love using glue dots so I don’t damage the wall or the banner. I HIGHLY recommend getting it professionally laminated! You can do that at places like Office Max or Staples I’m sure. That way you can use it every year. Pretty awesome right! If you don’t have a Walgreens near you for same day pick up you can still have it shipped to your door so no worries. If you end up printing them off use the hashtag #justdestinybanners so I can see! Here are some awesome codes for you to use right now. Check out all my other friends on the printable tour. Your will love them and plus their all FREE!!!! okay, love the banners but I really love how you share how to print them out. I never realized this. Thanks for sharing. How very creative! I never knew that Walgreens offered banner printing services. Thanks for the tip. 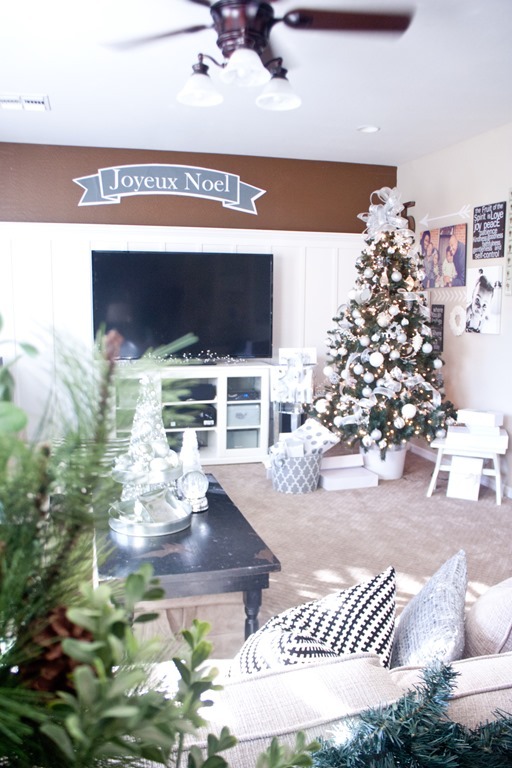 Fabulous holiday decor! WOW! This is amazing! Seriously. Thanks for sharing the printables and tutorial! I have always loved your banner since last year and wondered how in the world you made it! Thank you so much for sharing your secret with us and providing the free download! That is so cool! What a high impact banner!!! Brilliant lady! Curious….is this just paper or does it come out on “banner” material? Like a vinyl or flexible plastic? TIA! Your Christmas banners are lovely. I am so eager to order one for my home. 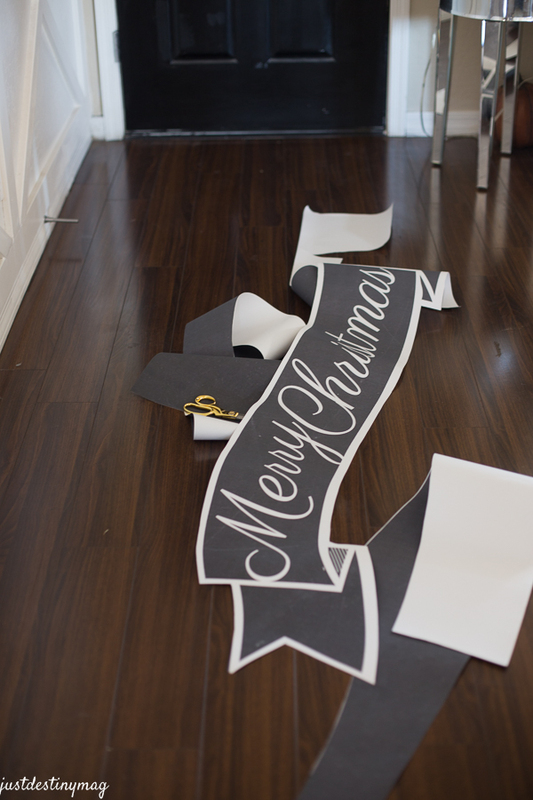 While preparing to order a banner from Walgreens, the downloaded photo of the Merry Christmas banner (the first one of the three) seems to have some scratches on it that transferred to the file I saved. It is not obvious from your blog, but when preparing It on the Walgreens site they are pretty obvious. Is there another image that I missed? Thanks for any help, and thanks for sharing your creatiions! Thank you so much for downloading the banner! The scratches are apart of the chalkboard digital paper that I used to design the banner. It looks lovely when printed. I’m sure you will enjoy it! Thank you so much Destiny, you are so kind to provide all this info. However, I can’t find a 1×6 on Walgreens site, just 1×3 and 2×6 and 2×8. Am I missing something? thanks! When I placed the banner jpeg that I downloaded from the link you provided, it gives a warning on the Walgreens site for low resolution. Was this there for you when you printed it? The file I’m using is banner you used in the tutorial and it’s 2.3 MB. Which banner did you download? I can check it for you! You shouldn’t have that triangle!!! Laura, did it still not work? I’m not sure why it’s not working for you?! I am having the same issue 🙁 These are so cute! Thanks for making them! Also, where did you get your stockings from?? Did you download it from my “shop” or did you save the image from my post? I am having this same issue. 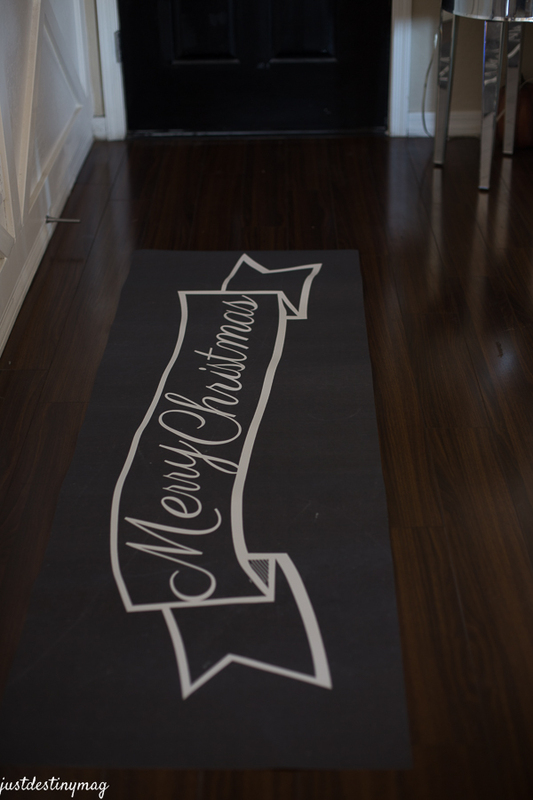 I just printed a merry Christmas banner and it did not come out as nice as yours from Walgreens due to low resolution. Is there anything that I can do to fix this? I am NOT typically an idiot but I am still not seeing the 2X6 option on Walgreen’s poster site? How am I missing it? 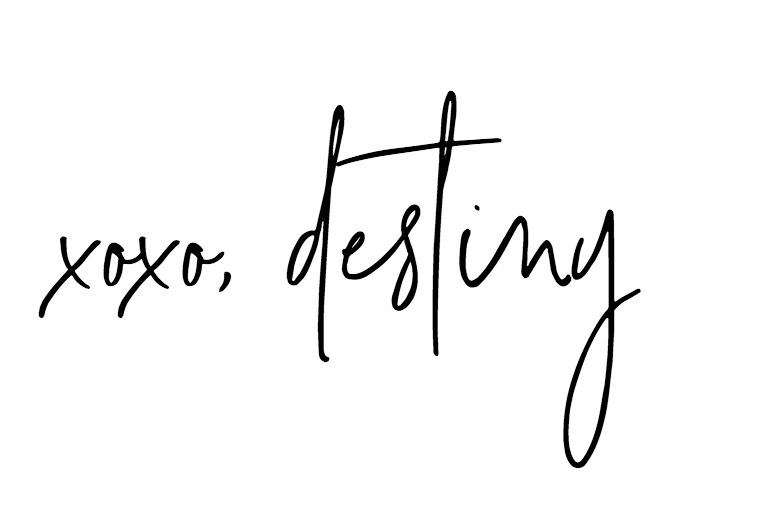 Hi Destiny, Love the banner! Your style is so cute. I’m wondering if you were referring to Walmart and not Walgreens when talking about printing the banners? I couldn’t find the option for banners of any size on the Walgreens site, but WALMART has them! Thank you soooo much for sharing this banner. I love it a LOT and thanks too for sharing how to print it out. You are awesome!!! Very cute, I love the way you decorate!! I must ask about that mantle. 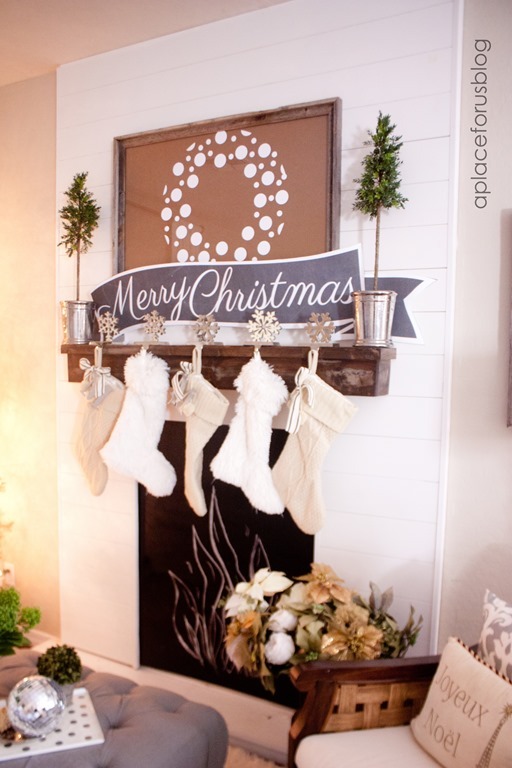 We don’t have a fireplace in our home but I really want to have a mantle to hang stockings! Where did you find, or how did you make yours? I was trying to see if you already had a posting about it but didn’t see one! I love it! 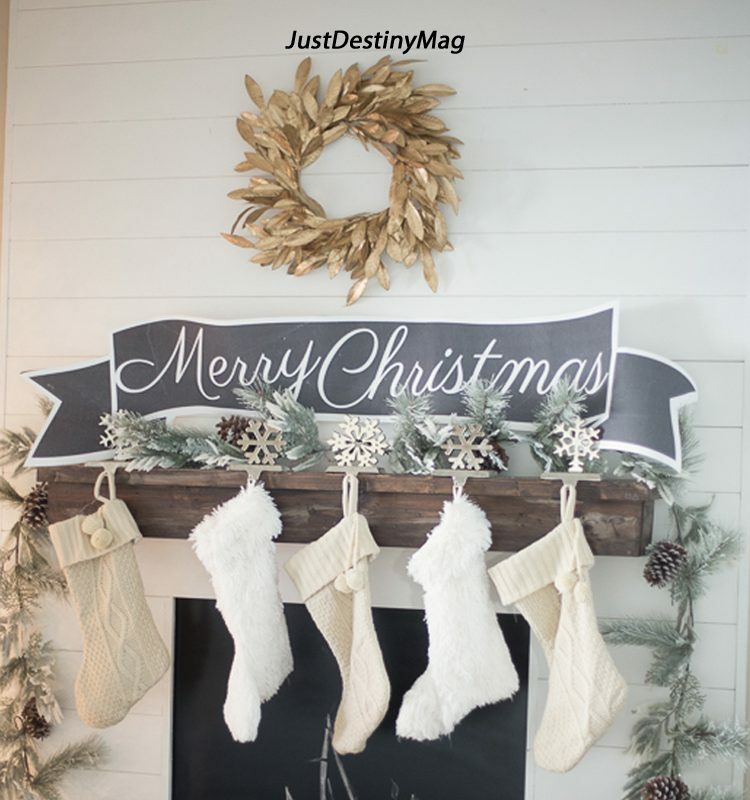 Today I m sharing my own free printable that I used in a Christmas mantel vignette, and at the end of this post you ll find links to many more printables created by my blogging friends for you to use! Destiny, I love the white stockings. Where did you find those?